If you're looking for a fun, not too far away place to get away for spring break, look no further! Las Vegas is the perfect destination for you. Everyone knows Vegas for the casinos, the gambling, the shows and the partying but there’s still a version of Vegas beyond that to be seen and enjoyed. If you have no plans for Spring break yet but are thinking about a quick, inexpensive road trip you and your friends can enjoy, you should consider Las Vegas. It’s only 3-4 hours away by car with so much to see. Is about 30 minutes outside of Vegas on the boarder of Nevada and Arizona. The hoover dam makes for a good day trip if you can’t stay in Vegas too long but it also has much too offer with its history, engineering and architecture. It’s also a nice sight that has great views perfect for some Instagram posts. Hoover Dam is open daily from 9 a.m.-9 p.m. with guided tours prices vary from $11-$30 depending on what parts of the dam you are interested in seeing most. Located in the center of Las Vegas’ desert is Ugo Rondinone’s art installation titled “Seven Magic Mountains”. It’s a public installation located near Jean Dry Lake approximately ten miles south of Vegas. The art consists of seven towers of colorful, stacked boulders. Each tower stands 30 feet high. Seven Magic Mountains makes for a great stop on your way in or out of Vegas and now would be a great time to see it because according to the artist this might be its last year on display here. Seven Magic Mountains is open to the public daily and is free of charge. If you’re not into the craziness that is Las Vegas a little juxtaposition might be exactly what you need. Red Rock canyon is probably the perfect place for you to get that quiet, serene spring break rest you want. 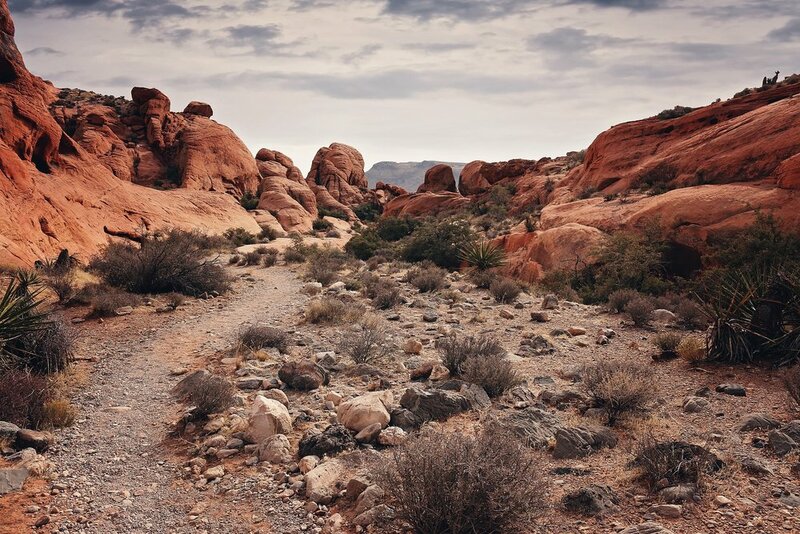 Red Rock Canyon located just 15 minutes away from the strip and is a 13-mile scenic route that you can either drive or hike. Red Rock offers the most beautiful views and allows guests to hike, picnic and even camp on their grounds as well as offering tours where you can learn about the wildlife and geology. Red Rock Canyon is open daily and is free however parking does cost about $10-$15 dollars per day. Another quick and quirky attraction Vegas has to show for itself is the Wheel of Misfortune. Located at an abandoned mining site just outside of Las Vegas is a large wheel that resembles the wheel from the TV game show “Wheel of Fortune”. This wheel was created back in 2012 by a graffiti artist, it is about 250 feet wide and quite literally represents all misfortune. Each space contains an even more unfortunate scenario than the last while some only contain “$0000” a no money value, others posses statements like “Lose All Hope” or “Lose a Job”. Being that Las Vegas is as bright and lit up as it is, it is no surprise that it would be the place that has a neon museum that carries all the cities old and iconic neon signs. Located on Las Vegas Boulevard, the Neon Museum is a cool, bright and quirky place to spend the day of the night remembering the old Las Vegas. It features tons of signs from old casinos, businesses, clubs and anything else you can think of. While the museum is open to the public, it is required that you request a guided tour (available daily) in order to see/walk-through the exhibit.